A brief post to sing the praises of this website (run by Michal Derela) devoted to Polish armoured formations 1918-1939, including armoured trains. For those interested in wargaming the 1939 Polish campaign the information contained on the site is invaluable. It is written entirely in English which makes it (as far as I can tell) a unique source. Michal is willing to take email enquiries about most Polish military subjects of this era. 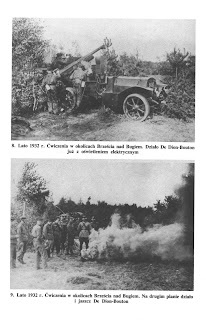 As an example, he emailed me the following photos of Polish self-propelled AA guns, on French De Dion-Bouton cars and then on PF621 truck chassis. 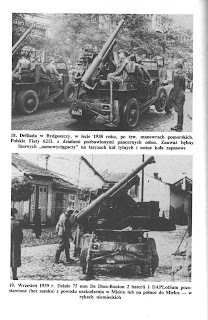 My enquiry followed a discussion on the BKC forum regarding the Polish equivalent of the 88mm on 12 ton halftrack fielded by the Germans and featured in my recent post. The upper picture in this pair gives a good idea of how the De Dion-Boutons looked. Here rear views of the French cars (lower) and Polish truck mounts (upper) can be compared. 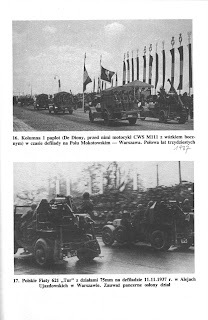 Stephen Zaloga and Victor Madej's book on the Polish campaign (The Polish Campaign 1939 - not the Osprey written by Zaloga alone) indicates that 12 of the 75mm AA guns mounted on the cars were re-mounted on PF621 trucks. Michal tells me the number of conversions was 4. It seems both SP mounts were involved in combat in 1939. They were employed primarily against aircraft but did engage tanks on a few occasions, and with some success apparently. Anyone interested in Polish military history of the 20th Century should check out this site. A link is posted (under 'Polish Military Site') to the left of this post. ...Which is a posh way of saying Odds and Sods. Over the last few months I have acquired a number of wargames products that might be of interest to readers of this blog, so I thought I would bring them together in one post. This gives me an excuse to show you some photos and make some comments. 88mm Flak 18 on 12 ton half track. Having found out about this vehicle on the net about 2 years ago, and reading that it was deployed in Poland in 1939, I have hankered after one ever since. I thought about doing a conversion of some sort, but had shelved the project when Battlefront Miniatures came up with the model as part of their 'Mid-War Monsters' range. Brilliant! In 15mm it towers over my Panzer Is and IIs, and is a very impressive model when made up. The hull is resin, the rest of the parts metal. The tracks and wheels fit easily and solidly onto the well-cast resin hull, but there are a couple of problems with the gun. First, it is supposed to be a Flak 18, but Battlefront provide what is obviously a Flak 36, with the prominent 'barrel nut' half way down the gun tube. This needs filing off. The parts of the gun fit together awkwardly, and if fitted as cast create a slightly lop-sided weapon, due to rather poorly cast trunnions. The shield is also not quite the right shape, having rather too much of a backward slope. Nevertheless, for wargaming the model is fine and produces an excellent result. As with all Battlefront kits of this type, it benefits from being provided with a full gun crew, an example which other manufacturers would do well to follow. The two shots above show the model posed on another of my purchases, a Faller 'Minimat' bought via Timecast. This is the cornfield colour one, 29cm x 40cms for £4. It formed the wheatfield in my 'Plattstadt' post. The mat has a paper backing but is proving to be perfectly robust and a good way of adding variety to my layouts. One thing that I have never liked is the common use of what look like bits of doormat for cornfields, where your Prussian Grenadiers or Tiger tanks can be seen delicately balancing on the tips of 4 foot corn stalks. This Faller mat is a much more acceptable alternative. The haystacks are another new item, bought from The Square (http://thesquare-wargames.co.uk). These resin casts are inexpensive and easy to paint up. Cart and Wagon - Parkfield Miniatures. If you have read my brief post about the excellent service I received from Parkfield, well, these are the wagons in question. Nicely cast, easy to put together metal models that have a very solid feel, and are perfectly compatible with 28-30mm figures. The models don't include the figures: these have to be purchased separately. The barrels are also an addition. The models are shown on another Faller Minimat, this time the 'light green' one. Having decided I'd like to field a heavy gun battery or two in my SYW games, I finally settled on the guns made by Elite Miniatures. The models I bought are actually from their French SYW range, but I'm not particularly fussy about these things so the Prussians and Austrians will get one each. The model shown is of a Valliere 8 pounder cannon, but compared to my RSM 'medium' guns it is pretty big, so I'm counting it as a 12 pounder. In fact, I shortened the barrel by a few millimetres to give the gun a more stocky look. The limber is a quick conversion of the standard RSM 2 horse limber to have a centre pole and cross-piece, with 4 RSM horses. The gun is loose and can be hooked up to the limber for travelling across the table. When deployed, it is placed on the base as shown, the crew being permanently fixed to the base as normal. This saves on buying 2 guns, and also allows the crew to 'run away' and abandon their piece, which can occur under the Rank and File rules that I use. RSM have recently acquired the rights to the SYW Spanish range previously cast and marketed by The London War Room. I bought a few of these to see how they look. As Rich at RSM says, they can be used to provide a bit of variety for other nations as well as being used to create Spanish armies. The pictures show how they compare to the normal RSM figures. As you can see, they are bit chunkier, the heads in particular being a fair bit larger, but in general I think they fit in quite well. The unpainted figures in the centre are an officer and standard bearer (sans standard). The painted officer on the extreme right is also a Spanish figure which has taken service with the Prussian Grenadiers. Also potentially useful are a couple of seated figures, an officer and a fusilier. The latter is seen in the background of the first photo and more prominently in the lower photo. Very handy to have in the odds and sods box. I should perhaps apologise for the clumsily painted Prussian eagles on the mitres of the right hand base of grenadiers. All I can say is I did my best, and from a couple of feet away you can hardly notice! Last, but very much not least, the new edition of Blitzkrieg Commander. There is no need for me to give these rules an extended review: the BKC website is full of appreciative comments, and there is also a summary of what has changed somewhere on the site. In brief, the best set of WW2 rules currently available have just got better. 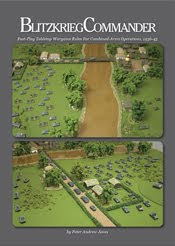 FoW gamers can use the 'one stand to a squad' scale and take part in a much superior game at the organisational level they are used to, or one can use the 'one stand to a platoon' scale and have multi-battalion games in an evening. The 140 page book retails for £20 plus £3 postage in the UK. This gives you all you need: no supplements required, as a very comprehensive set of army lists for most nations and periods is included. The basic rules only take up about 20 or so pages, a tribute to their simplicity. 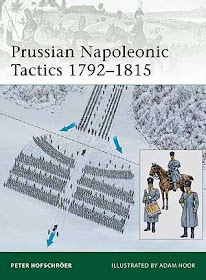 The rest of the book consists of examples (with colour pictures), details of various suggested scenarios , a few optional or specialist rules and the army lists. One feature I particularly like is that the photos are there to illustrate well chosen examples of play, rather than being eye-candy. Recommended? You bet. These rules are quite outstanding. A battle report with the new edition of BKC is pending, so watch this space.